Victoria Martín de la Torre (Madrid, 1973) has been a press officer of the Group of Socialists and Democrats in the European Parliament since 2008. She previously worked as a journalist mainly in the weekly Tiempo, where she was head of the foreign desk. She is a Fulbright scholar, and holds two Master’s degrees: one in Journalism by Columbia University (1999) and the other in European Politics and Administration by the College of Europe (2003). This non-fiction story recreates the decade that gave birth to the European Communities (1948-1957). 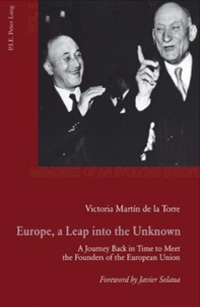 Written in a journalistic style, it shows the origins of the EU project through the eyes of the protagonists. Jean Monnet, Robert Schuman, Konrad Adenauer, Alcide De Gasperi and Paul-Henri Spaak – the so-called «Fathers of Europe» – are brought back to life, so that the reader can learn about their personal backgrounds and beliefs, and also see them in action. Their discussions are key to understanding how and why decisions which today affect the lives of 500 million Europeans were taken at the time. All facts and conversations have been taken from the memoirs of the protagonists, newspaper articles, speeches, EU historical archives and interviews with people who knew them. “Two months have passed since the participants left the congress in The Hague, and their enthusiasm has not materialized into any concrete action. Good words, as in the past, seem destined to remain just that: words. After the passionate speeches, no government has submitted a proposal, and to top it off, the movements are now entangled in internal disputes. Duncan Sandy’s European Movement questions the legitimacy of the European Parliamentary Union led by Coudenhove-Kalergi, who in exchange accuses Brits of torpedoing continental integration.